If good things really do come in threes, then Get Out of Sin City, Boca Chica's third full-length album, is the best of the good things. 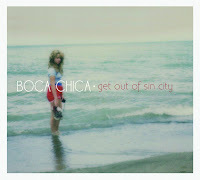 This is definitely my favourite Boca Chica album (so far). This album has everything I love in indie Americana music - gorgeous steel pedal that makes my heart swell while it makes me want to weep, boy-girl choruses, handclaps, a little twang, a lotta sass. And the band does it all so perfectly. This is a beautifully mature album that has me excited for the next one. Get Out of Sin City has a slightly laconic sashay to it, a hip-swaying strut down Main Street, cigarette and a bottle in hand. You know you're heading for trouble, but the sun's setting over the hotel bar and you're too invested in this drink to go home. Frontwoman and songwriter, Hallie Pritts has an utterly distinct voice that, frankly, I was never before completely comfortable with. But the songs and the arrangements on this album are perfectly suited to her unique vocals. In Pritts' hands, these songs take on the breeziness of cool indie dream pop, mixed with touches of dark folk rock, and leaning heavily on their classic country pedigree. Get Out of Sin City is a damned fine album, which I cannot wait to take out on a road trip. Windows rolled down, hair whipping in the wind, stereo blasting, following the yellow highway lines to Vegas. You got me at "indie americana". I will not be able to sleep until I check this out. "gorgeous steel pedal that makes my heart swell while it makes me want to weep"
What an accurate description how the steel guitar makes one feel. Reminds me of something I read somewhere about the sound of the banjo ; "laughing while your heart breaks all the while" or something to that effect.